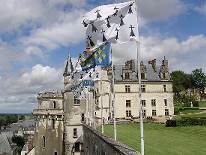 The Loire Valley (Vallèe de la Loire) is home to more than 300 châteaux. These castles were built between the 10th and 20th centuries, initially by the French kings but soon followed by the nobility, and the area is known as "the Garden of France". The royal Château at Amboise is a château located in Amboise, Loire Valley in France. Built on a promontory overlooking the Loire River to control a strategic ford that was replaced in the Middle Ages by a bridge, the château began its life in the eleventh century. Expanded and improved, in the mid 1400s, it was seized by Charles VII. Once in royal hands, the château became a favorite of French kings. The Chââteau de Villandry is located in Villandry, also in the Loire Valley. The lands were an ancient fortress originally known as Colombier until the 17th century. Acquired in the early 1500s by France's Controller-General for War under King Francois I, a new château was constructed around the original 14th-century keep. Its famous Renaissance gardens include a water garden, ornamental flower gardens, and vegetable gardens. The gardens are laid out in formal patterns created with low box hedges. Like all the other castles of the Loire Valley, it is a World Heritage Site. It is one of the most visited castles in France. The Château de Chenonceau, near the small village of Chenonceaux, Loire Valley in France, was built on the site of an old mill on the River Cher, in early 11th Century. We like this chateau so much that we use it in our logo! Chenonceau owes a large part of its charm to women: it was built in 1513 by Katherine Briçonnet, then made even more attractive by Diane de Poitiers and Catherine de' Medici, and saved from the horrors of the French Revolution by Mrs Dupin. Its lovely surroundings, the formal garden and the extensive park surrounding it enhance the grace emanating from the castle. More information on Wikipedia.org or tourisme val de la loire.